This is the gory moment Chinese zookeepers push a live donkey into the jaws of three hungry tigers. The terrified animal can be seen clinging on for dear life as workers in raincoats push it down a ramp and off a steep ledge into a tiger compound. 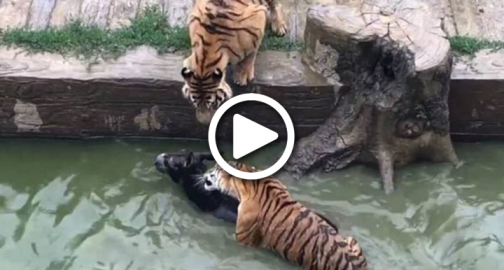 After landing hopelessly in the water, the donkey is soon attacked by two nearby tigers.